Indian automobile company Force Motors, which was first started in the year 1958 is currently riding high on the success of its commercial vehicles. This homegrown auto maker has introduced some of of the highly acclaimed commercial vehicles like Force Tempo, Force Traveller and Matador in Indian. This automobile company is associated with Daimler AG, ZF, MAN Trucks and Bosch. The manufacturing unit of this company is based in Pune from where it is exporting the vehicles to the rest of the country. The company also produced passenger vehicles for Indian auto enthusiasts by procuring latest and advanced technology. Force Motors also ventured in to the SUV segment and launched the Force One SUV for the Indian automobile market. The arrival of Force One in the auto markets has stirred the competition in the SUV segment, which is dominated by the likes of Tata Motors and Mahindra. Now the Force One has become more excited with 4X4 drive type options, which will enhances its off-road capabilities. However, there is no change that has been made to the engine technology or its mechanism. This Force One LX is the top end version launched with 4x4 drive type option, which will lock horns with the likes of Mahindra XUV500 and others in the segment. This Force One SUV model line is perhaps one of the good looking utility vehicles available in the auto market. It has a macho body structure with great set of exteriors that makes it look like a complete sports utility vehicle. This top end Force One LX 4x4 version has the same body design and exteriors as its mid range version. Its looks much bigger inside even from a far distance. Its majestic front facade is dominated by the chrome radiator grille, broad bonnet, large headlamp cluster and so on. This top end version also gets the LED day time running lamps incorporated to the headlight cluster. There are roof spoilers fitted on top that adds more sportier look. The design of the chrome radiator grille is very impressive with horizontal chrome slat adding premium and rich elements to its front. The prominent company logo has been fitted in the middle of the radiator grille and the the stylish Force One logo is fitted just under the grille. This top end trim is blessed with the body colored bumper with a protective cladding fitted under it. There is a large air dam and air ducts incorporated to the bumper along with fog lamps with chrome ascents. As far as the side profile is concerned, you can find the wheel moldings on top of the wheel arches that brings a macho body structure. The company has offered 16 inch alloy wheels with this top end version adding more style and elegance. Furthermore, you can find the electrically adjustable ORVMs and body colored door handles on its side profile. The rear part of this SUV gets the same look but without rear fog lamps. The interior cabin section of this top end version is plush and spacious than any other sports utility vehicle. There are tons of features offered inside this Force One LX 4x4 SUV that takes the comforts and conveniences to the next level. You can find the 12V power socket in the first and second row of the cabin for mobile charging. The interior cabin is blessed with all beige color scheme. The central console of the dashboard gets a wooden finish adding premium elements. This top end 4x4 version comes with seven seater option with greater leg space, shoulder room and head room. There are wide and well cushioned seats offered inside the cabin which are covered with premium quality leather upholstery. Also, there is a leather wrapped steering wheel that has been mounted with multiple functions on it. Apart from this, the gear shift knob is also wrapped in leather with chrome ascents on top of it. You can also find some of the other interior features including door open warning and display, central locking, over speed warning, a sophisticated 2-DIN music system, driver seat height adjustment facility and several other such aspects. This Force One LX 4x4 top end trim is blessed with a 2.2-litre FMTECH powerful diesel mill, which is currently powering the rest of the variants. Now this 2.2-litre, 4-cylinder, 16-valve, Turbo Charged inter-cooled engine has the ability to displacing at 2149cc . This turbo charged diesel engine is based on DOHC valve configuration that enables it to release a maximum 138.1bhp at 3800rpm and yields 321Nm of peak torque output at 1600 to 2400rpm. This engine meets the emission norms of Bharat Stage IV, which means better fuel efficiency and less emission of carbon dioxide. Its high performance engine is skillfully mated with 5-speed manual transmission gearbox that delivers the engine power to all four wheels. This version of Force One is blessed with a high performance 2.2-litre turbo charged diesel mill that produces mammoth power. However, controlling this SUV is not a hard task for individuals, thanks to the sophisticated disc and drum braking combination. The front wheels of this SUV have been mated with disc brakes with a twin pot type caliper as standard while the rear wheels have been paired with high performance drum brakes. Force Motors blessed this SUV with a very responsive power steering system that acts instantaneously in peak traffic conditions and makes it easy to drive the SUV. Its handling aspects are further enhanced by its sophisticated suspension system that also takes care of the drive comforts and agility. There are unique set of comfort and convenience functions offered with this SUV that makes this top end version far more sophisticated than any other SUV in its class. Some of its convenience features include progressive cruise control, air conditioner for all three rows, power steering, arm rest for driver and co-driver, power windows, service overdue warning, multi-information display , sun glass holder, coolant level indicator, electrically adjustable outside rear view mirrors with turn indicators, puddle lamp, and several other features. When it comes to the safety functions, the company has worked hard in incorporating some of the most advanced functions to this SUV. This SUV trim has been equipped with features like ABS, EBD, Remote Key access, fog lamps, tubeless tyres for superior grip on roads, front skid guard, collapsible steering, driver seat belt warning, reverse parking sensor, brake pad wear indicator, over speed warning, central locking, and several other advanced features. Pros: Appearance is fascinating, interior cabin space and comforts are good. Cons: Price could be made more competitive, mileage can be better. Force One is available in 6 different colours - Fierce Red, Emphatic Grey, Intense White, Moondust Silver, Bold Black, Robust Blue. 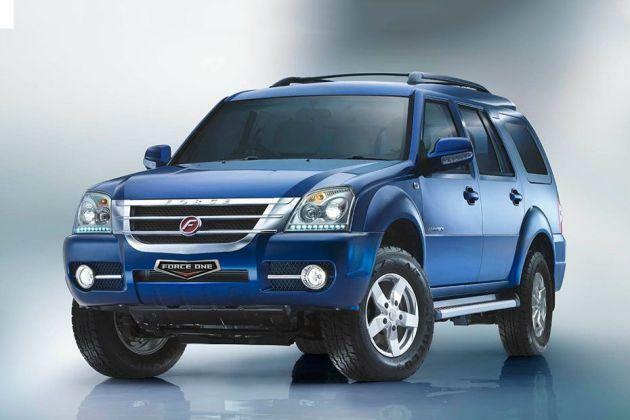 Force Motors launched 2 new variants of its SUV Force One. The variants are called the EX(executive) and SX(Superior). Force Motors launches the base variant and 4x4 on Force One?